OK, don't laugh, don't laugh, this is a reasonably sensible question. I'm just about to build up my third bike. It's a 29er Misfit diSSent rigid SS which will join a Niner SIR9 and a Commencal Meta 5.2 both running 3x9. This one's a budget build so I'm using what's to hand. Pedal choice is either some really nice platforms I've been saving up or some Shimano SPDs I pulled off my wife's bike (she wants platforms). I run Shimano 520s on the other bikes. I initially put platforms on the Commencal but I hated the feel of them on the bumpy/jumpy stuff. However I'd like to have one bike that I could ride in regular shoes, and can ride skinnies/features on without worrying about falling off clipped in. On the other hand, I've ridden clipless for so long that platforms feel very strange and insecure to me. So, which pedals for the SS and why? All problems in mountain biking can be solved by going faster, except the ones that are caused by going too fast. When I put my Karate Monkey together, I was running Crank Bros Mallet's. Could ride 'em either clipped in, or in regular shoes. Being as the bike was my first SS, they really helped out, when getting started on climbs, and stuff like that. I've since switched back to my Candy's, and threw the Mallet's on my 6" bike. How about this one? It has a broad base for solid footing, yet you can clip in. They are heavy as shet though. i would say clipless of some sort. you need all the power you can get on the climbs. when you are out of the saddle hammering it will be really nice to be clipped in. i'm running eggbeaters and love them. i've ran spd's and hate them, but that is just my opinion and i know lots of people that love spd's. SPDs because that is what you are use to using and your new bike is still just a bike. I just switched from the regular eggbeaters to the mallets. I love the eggbeater design, but IMO, I feel like having a platform makes it easier to to get started in the rough stuff. I admit my riding skills are still improving, but I like the extra security of riding with a platform clippless pedal. I got mine from ebay for like 47.00 shipped. If platforms are the pedal you want ... Crank bros 5050XX are good, so are the A frames. If you don't want to slip off over the rough stuff, there are two things you can do. Use big gnarly traction pins in your pedals, and / or buy yourself a pair of 5-10 Impact shoes. The 5-10 Impacts are so sticky that you have to lift your foot off to change position on the pedal...good stuff ! I recently tried the SPD647 platform clipless. Because they were longer, I had more pedal strikes, but I bike in very rocky conditions. Others find it easier to start on hills; after 3 rides I didn't find it much of an advantage. Went back to SPD 520/540 (no complaints). You can have mine for $55 shipped. I'd say go clipless as they seem to suit SS riding very well, you can get so much more torque through the pedals. I personally use Crank Brothers Smarties, nice and cheap and a lot nicer than my old set of XTRs! However I'd like to have one bike that I could ride in regular shoes, and can ride skinnies/features on without worrying about falling off clipped in. On the other hand, I've ridden clipless for so long that platforms feel very strange and insecure to me. I would definitely go with platforms. BMX pedals are nice. You may have to play around with the traction pins, but getting the feel you want is worth it. Right now my bikes have Snafus, Odyssey JCs, and DX copies. The Snafus and DX copies are both pretty grippy stock. The JCs need the longer (included) pins to be as grippy. You could buy a hybrid pedal (clipless on one side, platform on the other). Shimano has one and I think they're very affordable. They have a lot of haters b/c its hit and miss getting back into the clipless side if you come out on the fly. But they may make more sense for those like me who's SS was bought for trails that demand less on-the-fly clipping in an out (less technical, fewer hairpin turns). I'm new to SS, but I can't imagine going back to platforms and losing torque on climbs. I have stick legs and wonder if I could SS w/o clipless. I also think they're a plus when topping out on flats when you're spinning your cranks as fast as possible: more control and higher top speed. On the grounds that an ounce of experiment is worth a pound of theory, I tried putting my nice grippy BMX platforms on the bike and went off for a spin. I felt like an old lady. I think I am too used to the SPDs now. I rode hybrids for ages and eventually took them off because I only ever rode the clipless side and never the platform. I've been riding SS for 10 plus years. I use BMX flats and wouldn't consider riding with any other pedal. If you have a pedal you like on your other bikes just stick with that on the SS and maybe try something else if you're not completely happy with em, after you have SS experience. The torque issue. Clipless is NOT going to increase torque or power on a SS. You climb standing up and there is no way being clipped in is going to make a difference. I ride all the time with riders with clipless and I'm consistantly one of the best climbers......without foot retention. It's true that riding fast offroad with BMX flats requires more skill than clipless, but that's part of the fun. cheap SPD spuds are magic. platforms, specifically bmx platforms, and i use the longer size pins. used to tear up my shins when bailing, but now i'm a very proficient bailout artist. i would say just use whatever you are used to, stay comfortable. i seriously cant believe no one has recommended time pedals! The BMX peds are super grippy but it sure feels odd doing jumps and bunny hops in them after the clipless. Your skill levels will improve by doing that. It is a technique that you must learn / re-learn with platforms but it will make you more skillful once mastered. Relying on being clipped in to jump and bunnyhop is the easy way out..
And remember, the best jumpers and bunny-hoppers in the world are NOT clipped in. 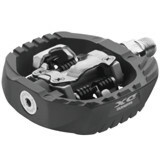 Kona platform pedals are pretty grippy and cheap too! I have them on my SS KM for when i am screwing around in town and rock time pedals when out on the trail. on my commuter ( which is a fixed steamroller) i rock bright green animal bmx pedals, which i also love. i say got for the bmx or some kona platforms!